Sunday. Emom x 20. 1st, 15 pull-ups. 2nd, 15 wb. 3rd, 10 front squats @ 60kg. 4th, rest. Today was a busy day even though it's Sunday. We had some errands to take care of and then there was ice hockey world championship's final day and teams are fighting for bronze, silver and gold medals. Finland was part of this dog fight but Canada took them out on the gold game. 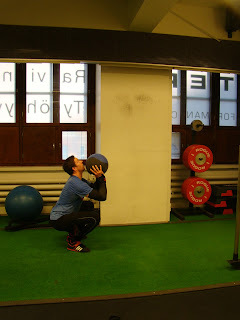 We went to to the gym for a short session with Pauliina. This was not supposed to be the toughest session of them all. At first I thought about having a recovery day in the form of just jogging for a while but once wife suggested some couples retreat at the box I started gathering my gear up and was ready to pump it up! These were unbroken sets for sure. There was practically no warm-up prior to this one. No time for that. Just mobilized some joints and then hit it. 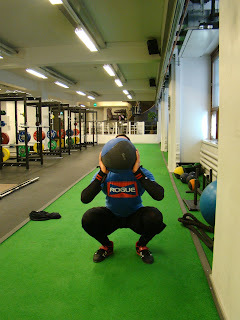 Pull-ups started to become a factor and legs were on fire, especially on the last 2 rounds. Good one!